The more I read about Thales of Miletus, the more I believe that he was the ancient version of the Renaissance man. Philosophy is a thinking exercise that usually involves a considerable amount of time. Most of the population of any age or society are involved in making a living and putting food on the table. Thales of Miletus, possessing an entrepreneurial spirit, cleverly dealt with the issue of time and money. It seems he made a fortune investing in oil-presses before a heavy olive crop harvest. All of which suggests that to be a philosopher and scientist in Ancient Greece, 7th century BCE, business skills are a notable asset. Thales significance as a philosopher centers on methodology. He was the first thinker who tried to find common, underlying principles to account for the natural world, rather than relying on the whims of anthropomorphic gods. He sought to give a naturalistic explanation of observable phenomena that still has relevance in modern scientific exploration. Thales believed that the mind of the world is god, that god is intermingled in all things, a viewpoint that would shortly emerge simultaneously in a number of world religions. Thales lived in the past, yet his thought process made him universal. He would thrive in any age. This entry was posted in Philosophy, Thales of Miletus and tagged Philosophy, Thales of Miletus. why do you think vastly differing cultures arrived at the same point in thought at the same time? I have often wondered about synchronicity vs coincidence vs cause & effect. There are so many events that are experienced or occurring together – on different sides of the globe. It is something that I would like to research further. Statistics is an elegant subject! It taught me that conversations, debates, and decisions have the best chance of being successful if you use a hypothesis structure and complete a valid compilation of data. Usually we only collect the data that supports our intuitive belief system. Because we are defined by the finite, humanity has a way of jumping to conclusions before looking at all the facts. Inadvertently, based on time constraints, we choose short-cuts. I wonder if ancient travelers were more intrepid than we give them credit for, or if perhaps spurred by the power of the written word the child awakened. A very interesting thought! It is very easy to fall into mediocrity because it appears to be safe. Maybe there is a balance. When you figure it out – let me know!!! And the more I read about philosophy, the more I realize that there are many interesting points of view. One thing I know – philosophy demands a considerable amount of thought!! When one reads about these wise men of old, it is hard for us to realize that they were human and lived much like we do today. They had to make a living, put food on their table for the family, etc. And still they had time to make these great observations and discoveries. Great challenge for us! Indeed, we forget that they were humans who had to function and participate within a society. 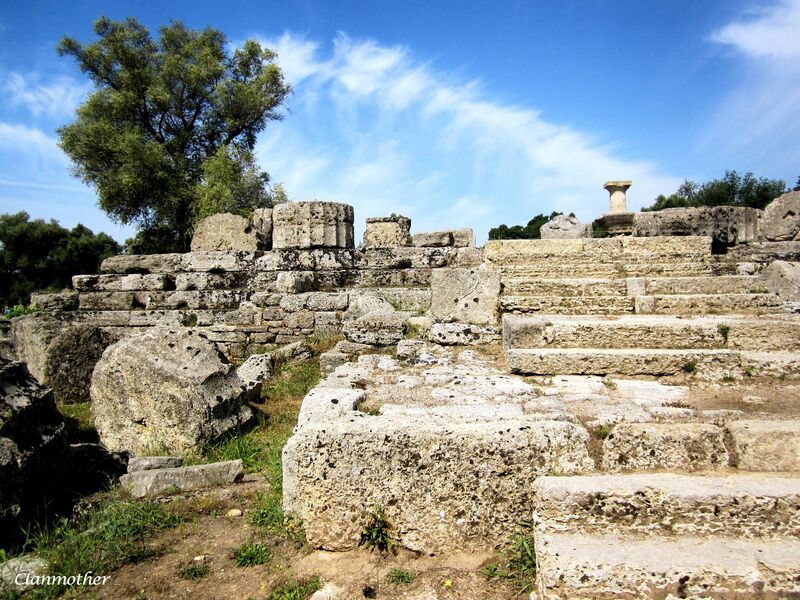 What a lovely post Rebecca – the Greeks knew it all, didn’t they! Thank you, Valerie! Philosophy is a detailed study that requires time, which most of us don’t have an abundance at our disposal. Since I missed the Olive Press opportunity, I decided to look at the highlights! What fun! Thanks for this, Rebecca. Again we stand on the shoulders of giants. The great philosophers and thinkers of the ages have left a road map for the rest of us to follow if we are willing. So true – the map is there, but the road is incomplete. May we have the courage to continue. I admire Socrates, his righteousness and his wisdom. Whenever I view the painting “Death of Socrates” by J-L David and the history behind it, I shared the sorrows of Socrates’ friends of losing him….. When I read the quote of Drucker, sadly I only thought of modern world’s fine line between “entrepreneurship” vs exploitation of the weaker. Exploiting an opportunity does not always sound positive to me (unfortunately). I can’t find back the quote of Tolstoy, who has pointed out a notion that increase of someone’s wealth is almost always the result of exploitation of another’s; that sounds quite extreme, but in essence it is also true if we are speaking of the zero-sum game in this world. “Death of Socrates” – even the thought of that painting brings a profound sense of loss. Whenever we talk about equality and human rights, it comes down to sharing the resources in a way that provides for all. I think that Plato, centuries ago, said it the best. I am so glad that you stopped by! I have been having trouble receiving my e-mail notifications from WordPress – worried that I will miss your posts!!! Have a great weekend.